A chakra in our breasts that emits spiritual nourishment into life… a secret substance in our bodies to heal the earth… a direct connection from our wombs to the creative center of the universe…. Body of Wisdom is now available for purchase on Amazon. "In Body of Wisdom, Hilary Hart gathers the wisdom teachings of a diverse tribe of seers and healers, grounded by her own clear and generous voice, to guide women in reclaiming our forgotten power. At last, the ancient esoteric teachings are made available and accessible, our deepest shadow revealed to be our most radiant gift. This book is an act of peacemaking, a healing tincture for repairing the world." — Mirabai Starr, author of God of Love: A Guide to the Heart of Judaism, Christianity, and Islam. "I want every woman I know and love to connect as I did with the tender and powerful message of Body of Wisdom. This is not merely a treatise about the deep and glorious possibilities of women’s spiritual nature, it is an immersion in the shared longing of our hearts. An encounter like this is both rare and completely natural. Call your women friends together and study this book with them. It is a genuine gift, and a living prayer." "Body of Wisdom is every bit as thoughtful, and as richly multi-layered as its title suggests. Has it never occurred to you that longing might actually be a power? It hadn’t to me either, but now I’m a believer – a believer in Hilary Hart, in her “cloud of witnesses” (teachers, healers, shamans . . .), and in the tremendous surge of remembrance she believes is awakening now – as it absolutely must, for life depends upon it -- in women everywhere." — Carol Lee Flinders, Ph.D, author of At the Root of This Longing and Rebalancing the World. 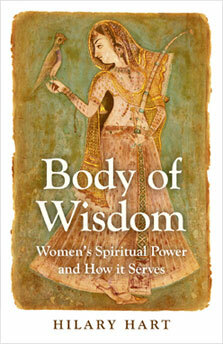 "Body of Wisdom acknowledges the power of women and how we can serve each other and the world. I encourage you to read this book often and do the exercises to wake up the wisdom found within all aspects of ourselves: emotionally, mentally, spiritually, and physically." — Kris Steinnes, Founder of Women of Wisdom Foundation and author of Women of Wisdom, Empowering the Dreams and Experiences of Women. "Body of Wisdom is a must read for any woman who values and longs to embody self, earth and spirit! It is a unique and satisfying journey, rich with poetry, meditations, exercises (not rules) and lots of spiritual guidance to help each of us evolve. Hilary Hart reminds us that women are the bearers of children, nurturers of soul, and promised guardians of the earth. We have the wisdom, energy and unique power to return wholeness, sacredness, integrity and love to all of existence."